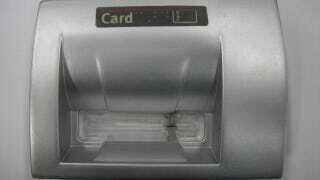 There have been plenty of attempts to make ATM skimmers look realistic—including 3D printing—but this is perhaps the best yet. Reported by Krebs on Security, you would have to be an expert to spot it. The device was discovered in a bank in San Fernando Valley earlier this year. From the front, it is almost perfect. The only giveaway? A tiny, tiny pinhole on the right hand side of the device (see the close-up), through which a small camera can capture PIN as skimming victims type them in. Flip the innocuous-looking device over, and it becomes clear that its intentions are underhand. The all-in-one device records card details and PIN, and is powered by what looks like a phone battery. Police still haven't worked out who placed this device—which is believed to be one of many—on the ATM where it was found.